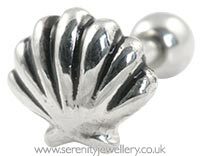 7mm wide sterling silver clam shell on a 6mm or 8mm surgical steel bar with 3mm screw-on ball closure secured at the back of the ear. high quality product, lovely finish. 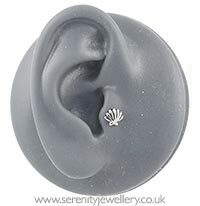 Perfect size for my conch piercing. Lovely detail, exactly as described. My new favourite shop! Because the end ball is quite small can be a little fiddly. I love it! It's exactly as pictured. 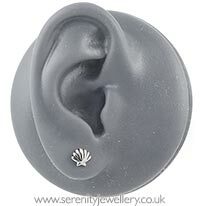 I originally bought the 6mm, but it was a bit tight, so I am grabbing an 8mm as well! 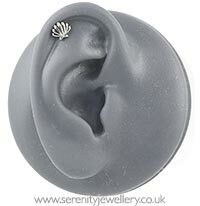 What a cute earring! I love it. I bought this on a whim and I love it. I put it in my helix piercing and it fits over the lip of my ear perfectly. Really sweet!